A poetic and universal artwork. Everyday life events drove Hélène to look into the medical imagery. As a visual artist and sculptor, she is part of the Wonderful Art movement: a positive, spiritual art looking for the proper essence of Creation. A delightful movement linking back Spirituality and Art. Her signature : « Create to live and make a better world ! ». Trigger dream, reflection, questioning and spiritual elevation, hoping to improve human condition. She did not expect a simple radiologic exam to awake within herself an insatiable desire to create! 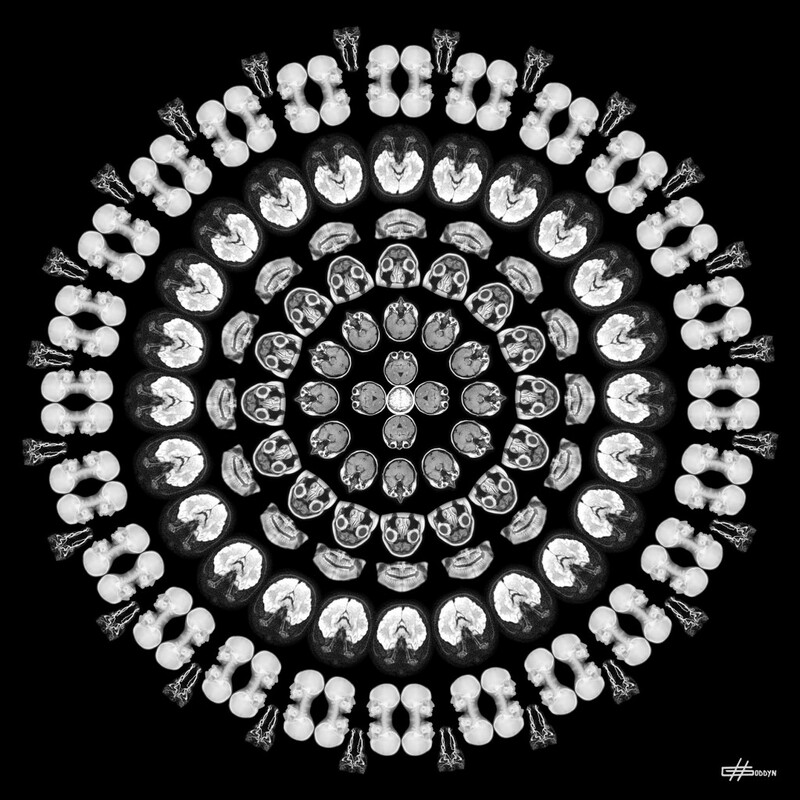 This perception of the deep nature – made visible thanks to medical imagery – gave birth to her series : « The Human Mandalas ». 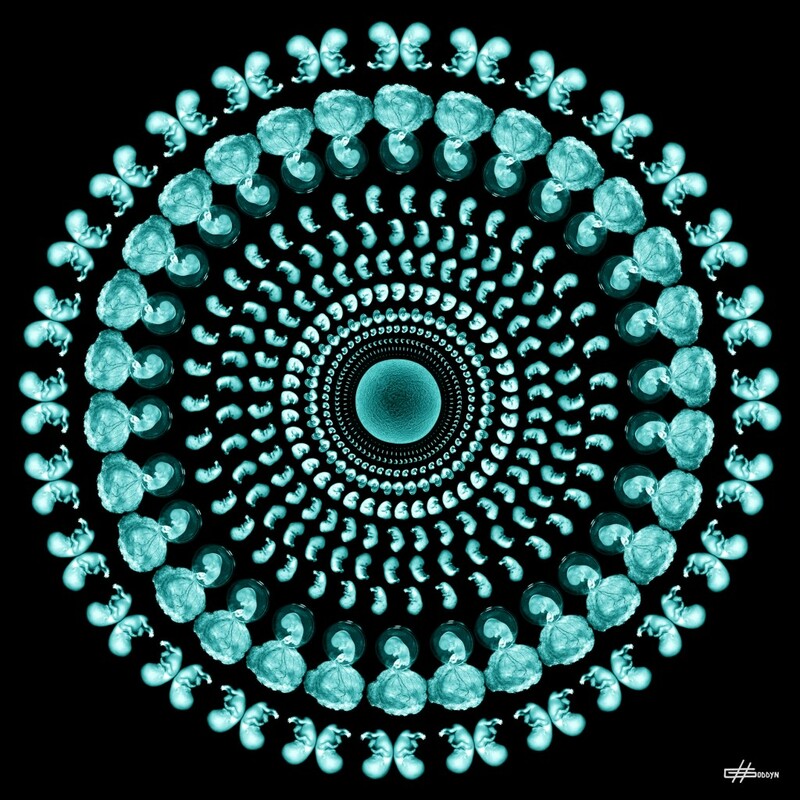 The mandala is a sacred worshipartobject. 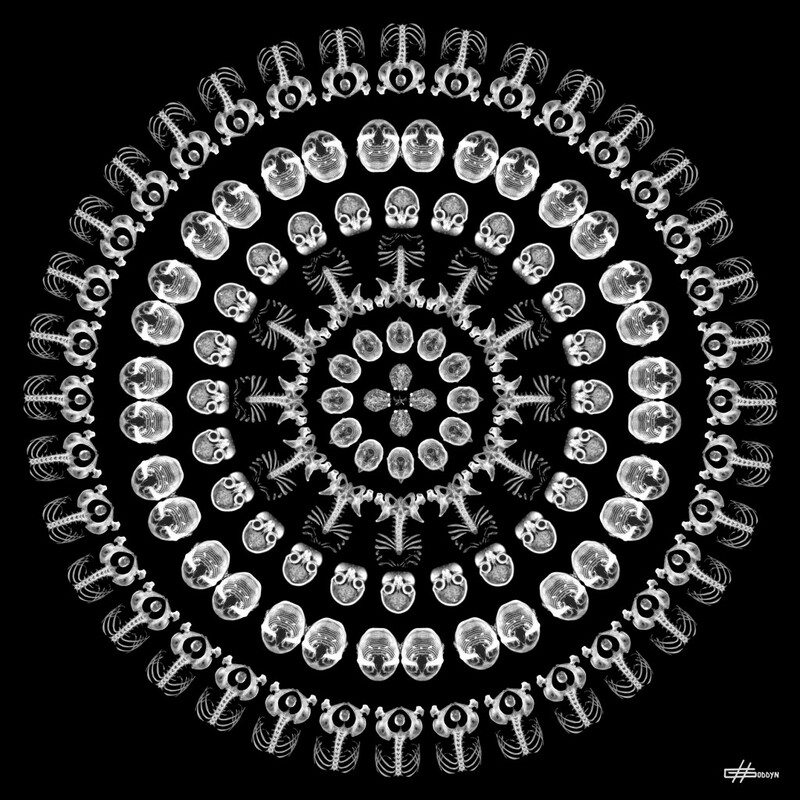 As a strong symbol, the medical imagery mandala constitutes a perfect harmony. Both lead us to the way to the research; one explores our body while the other helps us discovering our inner pathway. 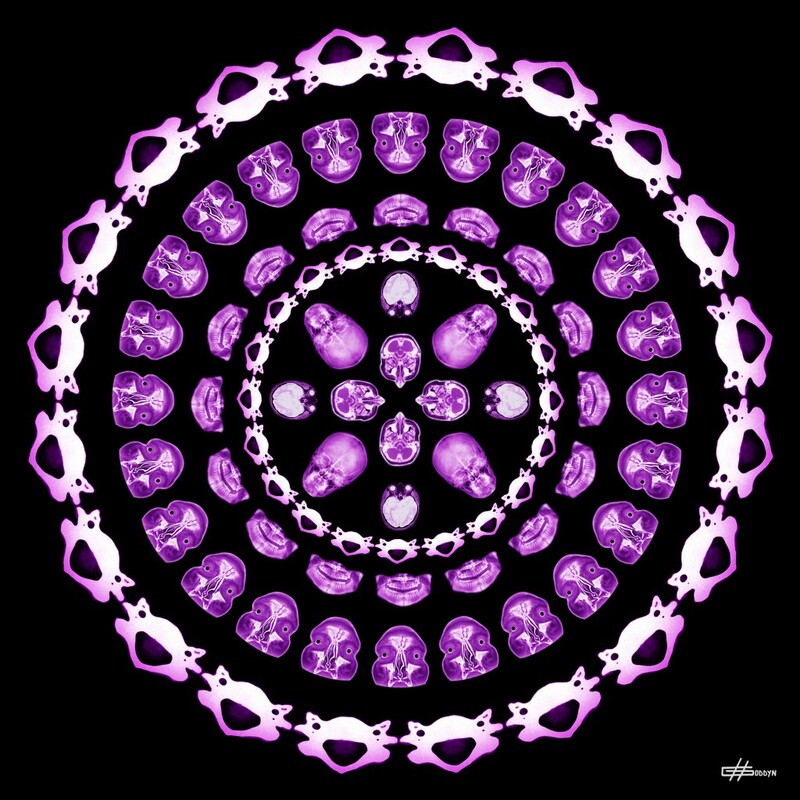 The mandala helps recovery, protects us, just as medical imagery progresses helped the Man to become « transparent » and thus be treated and cured. 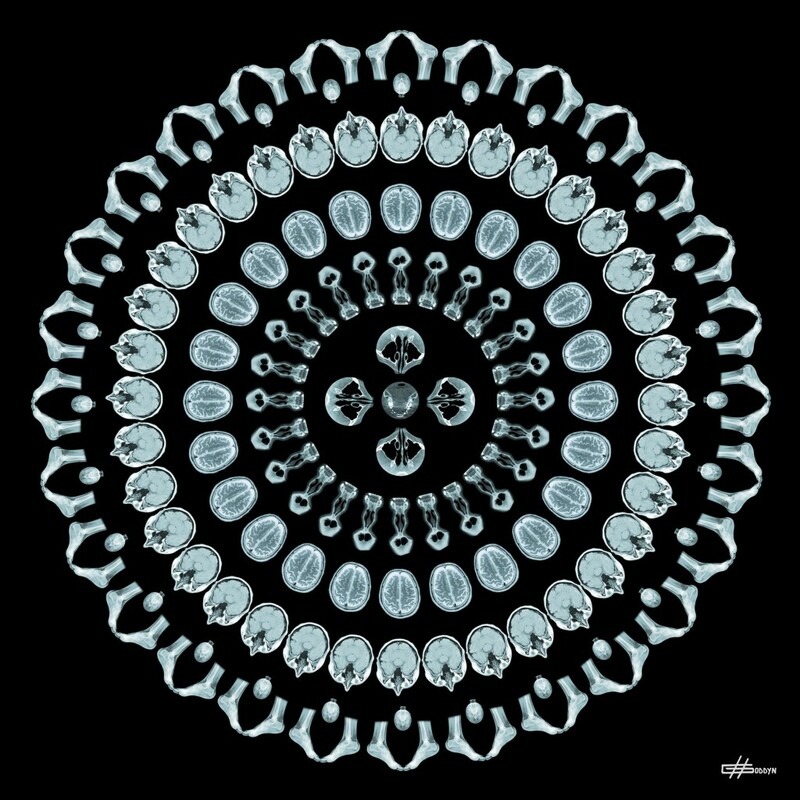 Besides, the human brain creates itself « spontaneous » mandalas through its dreams, its fantasies and its drawings ; these represent The Oneself according to Carl Gustave Jung. 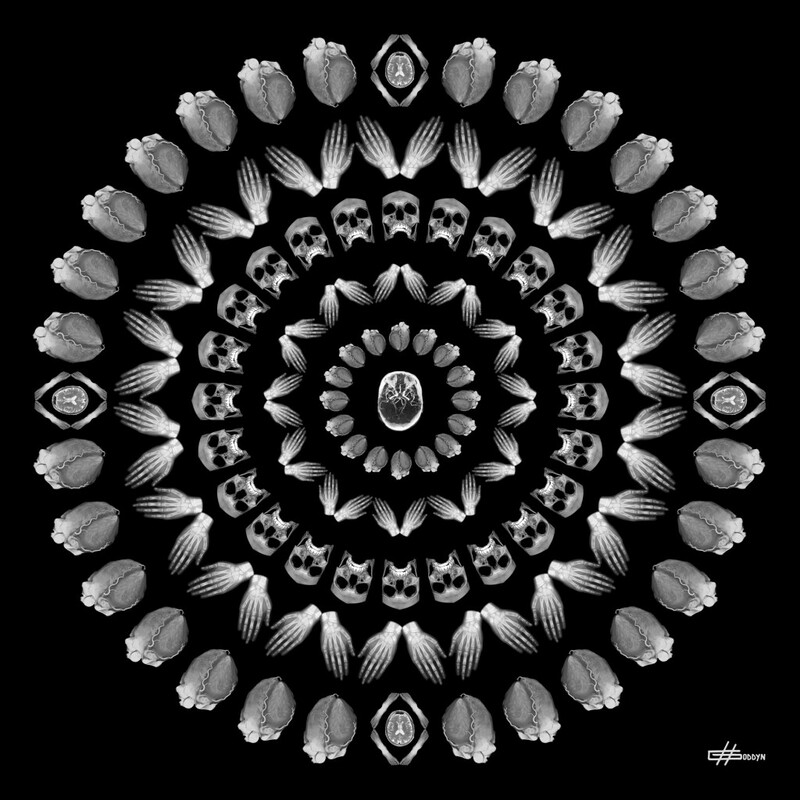 Therefore, this Swiss psychiatrist developped the mandalas as therapeutic and educational (refocusing) tools; the mandala, that Jung called the magical circle, draws intuitively attention on spiritual elements through contemplation and focus, leading to inner reconciliation. Whether you belong to the medical sphere or you are amateur or novice, you should note the poetry and positive energy emerging from these works. How to remain indifferent to the beauty of our deep nature? 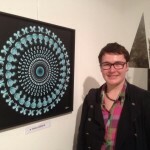 Hélène Goddyn, visual artist and sculptor born in 1979 in Lille, lives and works in Marcq-en-Baroeul (France). Hélène worked in advertising as a former art director and had to sacrifice her talent and growing passion for Art. She decided to gain her freedom and live from through her art as her salutation. This is how Wonderful Art ou l’Art Merveilleux (Marvellous Art), an artistic movement she co-founded, was born in 2010. A positive, spiritual art seeking the essence of creation. 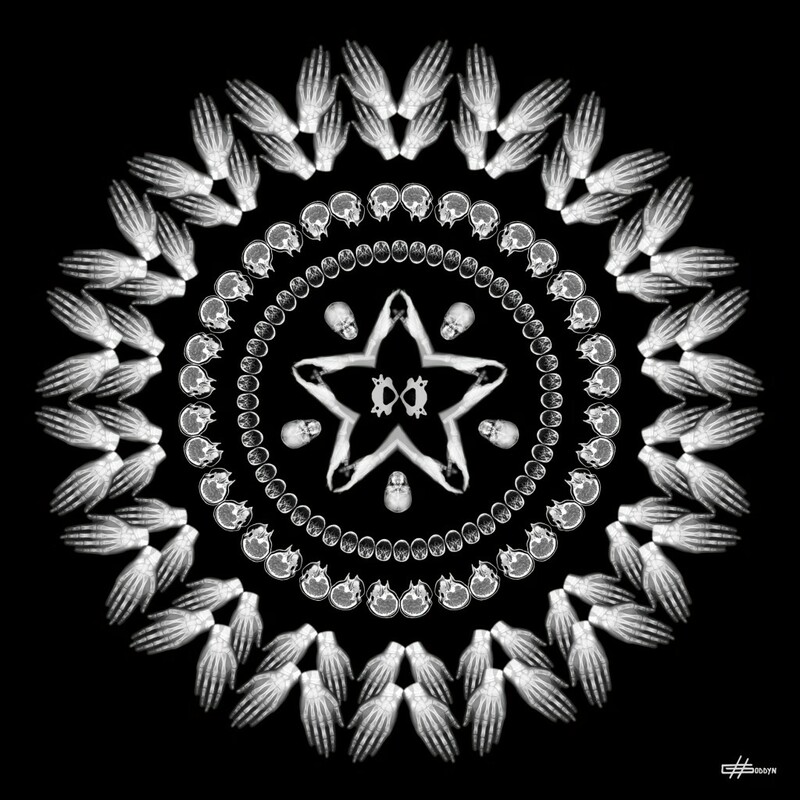 Beyond her art work, Hélène communicates and shares with the art community via her website www.wonderful-art.fr, created in 2011. She shares her research and her creations through weekly articles, the aim being to discover them by creating an exploratory lab regarding spirituality in the History of art. Nourished by all cultures, even the most ancient Hélène’s work shows great modernity. By mixing techniques both diverse and complementary her creative work reveals real reflection. To do this, Hélène uses painting, digital art, drawing, sculpture, adding color, symbols, messages and positive energy. Creating a better world, activating dreams, analysis, questions and raising spirituality aiming to improve humanity. "Create to live and make a better world" is a true insight to her personality. Impregnated with graphic and plastic ‘sculptural’ culture, she does not forbid herself anything. She lets her creativity speak for itself and continually experiments both with materials and subjects: an idea fusions, a desire is born and creation takes shape. Hélène exhibits in different galleries and art fairs in France and internationally, but also in prestigious art locations such as "l'Espace Pierre Cardin" or "l'Espace Christiane Peugeot " in Paris.